123-txt makes sending bulk, automated and personalised SMS easy. Get your message out in just a few clicks. Want to send an ad hoc message? Just type the contacts name or number as you would on your phone. Want to send messages to numerous people simultaneously? Use contact lists to send out messages to entire groups at the click of a button. This is the easy part. Just hit the big green button secure in the knowledge that your message will be delivered via the fastest SMS routes available. 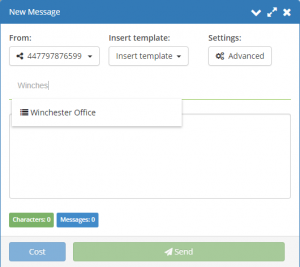 Before you send you can also quickly check the costs associated with sending the message. This takes into account the length of the message, number of recipients and the location of their numbers. Protect your company’s relationship with customers by limiting the number of messages you can send your contacts. This is particularly useful for organisations where a subscriber may be on multiple ‘mailing’ lists and therefore subject to a large number of correspondents. Set messages to high-priority in order to override any restrictions. This helps to ensure your contacts always receive important communications. If you are sending out a campaign or survey and expecting a lot of responses, you can drip feed the delivery of messages over a designated period to manage your incoming traffic. Plan ahead and maximise the impact of your messages by scheduling a time of delivery that will optimise engagement. You can also set messages to repeat on particular days, months or years. This can be really useful for recurring events or appointment reminders. When sending web links in a text message you can use the automated TinyURL function to create a short url to save on characters used in the message. The TinyURL itself can be customised to create recognisable branded links. Using a TinyURL means that you can also track engagement by seeing who did and didn’t ‘click’ the link. For those sending similar types of messages on a regular basis, the ability to create templates will both save you time and help make sure your communications and branding remain consistent. The length of a standard SMS message is a mere 160 characters which can often be prohibitively short. To make sure you can always communicate freely via SMS, 123-txt allows you to send messages of up to 1,530 characters. 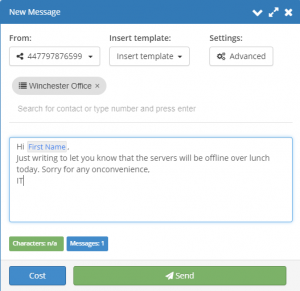 The 123-txt platform has a range of interfaces to make sending and receiving SMS messages as easy and intuitive as possible. That’s why we’ve utilised familiar interfaces such as a ‘mobile chat’ view. This allows you to have a seamless 1-to-1 conversation and look back through the conversation history for reference with a single scroll. 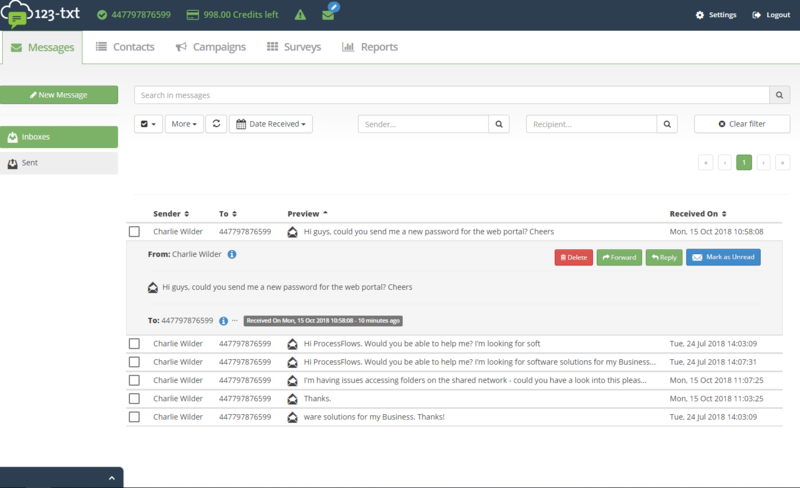 As well as an ‘SMS chat’ view, 123-txt has a fully featured ’email style’ inbox for all of your inbound and outbound SMS. You can sort messages, search your entire database by name, number, message contents and date, as well as reply and forward directly from the message. VMNs look and operate exactly like a regular 11 digit phone number. This allows you to have seamless international two-way communications via a centralised online SMS gateway. It can often be useful to have numerous VMNs for different tasks or personnel, helping to separate functions and limit the risk of mixing up communications. Shortcodes are 5 digit numbers that are designed to be easier to read, write and remember. They can be used in conjunction with keywords to trigger events. An example might be an estate agent’s For Sale sign that read “Text HOUSE123 for details about this property”. Doing so could prompt a reply message or call back amongst other actions. Alphanumeric Sender IDs allow you to set the sender ID as your company name or brand. They can be up to 11 characters including numbers, letters and spaces. By branding your outbound messages you make them instantly recognisable and instil confidence in the recipient. 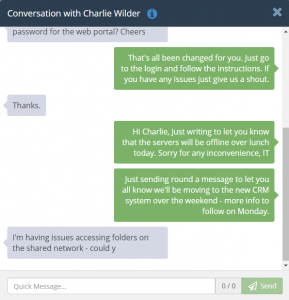 Alpha IDs only support outbound messaging. This makes them ideal for outbound communications and information blasts.